Located in the heart of Sentosa Island, Mövenpick Heritage Hotel Sentosa is just a stone's throw to the island's main attractions such as Resorts World Casino, Universal Studios Singapore and the 3km stretch of white sandy beaches. With a striking view of the iconic Merlion statue, an emblem synonymous with Singapore, the hotel is conveniently situated directly opposite Imbiah train station on the Sentosa Express. 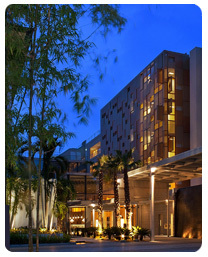 Our upscale lifestyle hotel offers five-star facilities spread out over two distinct wings. The historical Heritage wing with its traditional architecture and the newly built Contemporary wing offers individual accommodation styles for both business and leisure guests. Linkbridge restaurant, located in the glass-covered walkway spanning the two wings of the hotel serves both buffet and a la carte breakfast, as well as an all-day dining menu of both Asian and Western favourites. For the convenience of our guests, In - Room dining service is also available in the guestrooms. The inviting 21-metre outdoor infinity pool situated in the hotel's central courtyard is the perfect way to cool off from the warm tropical climates of Singapore. Currently available in the Contemporary wing, there are 81 Deluxe Rooms, 24 Club Rooms, and 3 Executive suites. A further 2 Penthouse suites and 19 signature Onsen suites are expected to be completed by mid 2012. 0-5yrs (up to 6th b'day) Children sharing the same room. No charge for accommodation in existing bedding/cot and each eats free. 6-12yrs (up to 12th b'day) Children sharing the same room. No charge for accommodation in existing bedding/cot and 50% discount on the dinning in Linkbridge restaurant. 12yrs + Extra person rates apply for accommodation S$ 80++ and breakfast S$ 34++. Any cancellation within 48 hrs prior to arrival or no show will be subject to one night charge. a. Guaranteed early check in charged at 100%. Early check in/out requests, subject to availability during stay. b.	Rollaways and cribs (infant beds) may be available and should be requested at the time of booking subject to availability, fee may apply. c.	Photo identification and credit card or cash deposit is required at check-in for incidental charges. Pets are not allowed.